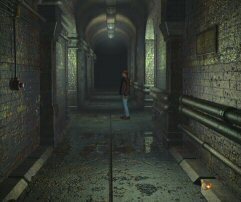 Gameplay: This point and click game comes in 2 CDs and can be played without CD on the drive after installation. The main menu has New game, Save game, Load game, Options, Credits and Quit. The Options menu has selection for antialiasing, shadows, volume and subtitles. The volume and subtitle selections can be adjusted by clicking on the red circle to select it and moving the cursor to the position wanted. To access the main menu during gameplay, move the cursor to top right of screen and click on cogwheels. To save a game, click on an empty frame to save a new one or on an already saved game to overwrite that old one. Click on the balls to scroll the frames. There are 100 slots for saved games. To load, select the frame wanted. The inventory bar is at the bottom of the screen. The scroll icons are balls at either end of the bar. Items can be combined by selecting one item and clicking it over another. Right click on all active items to get more information or to do additional actions. Press the spacebar to skip the intro. Double click on exits to hasten the transition. The cursor is red on active items and will flash on items when an action can be done with an item is on the cursor. Francois calls Martin Holan and talks about a German mine excavated in Western Bohemia. Professor Francois de Vilde, Martin's uncle talks about NiBiRu - the 12th planet and the German's belief in it and extraterrestrial existence. The contact in Prague is Barbora and she is waiting for Martin at Charles Bridge. Bridge: At Charles Bridge in Prague, a painter and a tourist is there but no Barbora. Inventory has wallet with money and cell phone. Find Barbora - Talk to painter. While waiting for the painter, look at the statue. Talk to the painter twice. After telling you about the stranger, his painting and St. Thomas statue, the portrait of the man is now in inventory. Look close - right click at man's portrait in inventory. Go back to St. Thomas statue and look close at pedestal of the statue. Right click on pedestal to get the paper slid under the label of the pedestal. Read the message from Barbora in inventory. Right click the cell phone and talk to Francois. Barbora Kanska lives at Cechovni 52. Barbora's Apartment: At Cechovni St., try to enter the brown door. It's locked. Click again and click on B. Kanska's buzzer twice. Enter building - Buzz other tenants and see if you can find somebody to let you in. After trying 5 buzzers, someone in #12 will let you in. Find what floor Barbora is on - Read-right click on the bulletin board. Right click the mailboxes on the left. Ah, Barbora is at flat 17, 5th floor. Take elevator. Enter Barbora's apartment - Ring doorbell on door at end of hall. Apartment lights are turned off. Knock on door twice. Try climbing up to the attic. Go down and right click the bulletin board. Read a missed message about where the attic key is located. Go back up to 5th floor and click on sign beside the fire extinguisher to get the attic key. Go up to the attic. Click on the light switch right of the door. Pick up the rag at bottom shelf by door. Take the rope by stove. Pick up the brick supporting the wardrobe to expose the window. Martin noted that something rolled on the hole on the floor. Take marble from hole on the floor. Use the rag on the window twice - first to break and then to remove the remaining pieces of glass. Use rope on the beam at center of room. Automatically, go out the window and enter Barbora's apartment. Bonk! Wake up 2.5 hrs later. Check everything in the ransacked room. Take the purse from the floor. Right click the purse in inventory to get Barbora's ID card - ID 87 Central City Archive. Look at the computer. It needs a password. Enter the bathroom door right of screen. See a dead Barbora. Click on her bloody hand. Check the sink. Check the cat on the hamper. Right click the cat to read his collar as Felix. Exit Bathroom. Go to computer, type in the password - felix (small case) on your own keyboard and press enter. Automatically, access the file about the mine. Police siren is heard. The phone rings. Talk with Uncle Francois. Exit the building. Center City Archive: Automatically call a worried Francois. You need the report of discovery to get a permission to enter the mines. Then bring that report to the State Institute of Care of Historic Monument to get permission. Click on door of the building to get closer to the building. Then talk to the pensioner feeding the pigeons. Enter the building and talk to the guard. He won't let you in. Enter the archive - Exit the building and the park. See a closed Bureau building and a sleeping beggar. Go left to the kiosk. Go to the subway exit left of kiosk and a child drops a firecracker. Talk to the child and later give her the marble in exchange for the firecrackers. Buy matches from the kiosk. Go back and talk to the now awakened beggar. Buy cigarettes from the kiosk and give it to the beggar. Go back to the pensioner in the park. Click the firecrackers on the pensioner. Talk to the pensioner. He wants a bottle of wine to help you enter the building. Go back to the kiosk and buy wine. You get a boxed wine but the pensioner wants bottled wine. Talk to the beggar and take the only bottle on the ledge left of the beggar. In inventory, combine the bottle and the boxed wine to get bottled wine. Go back to the pensioner and talk to him about the bottle of wine or click wine on him. He gives his old employee ID. Enter the building and talk to the guard. Show him the old employee's ID card. Barbora's office is at the basement #24. Go to bottom screen. Barbora's office - Go by elevator. There's a tube post beside the elevators. Use Barbora's ID card on the card reader of the door on the left. Notepad - Check everything. Look close on her desk. Right click on the notepad. Take a pencil beside the Black Mirror game box. Ooh, a plug! Look at and move (right click) the upside down picture of Felix. Take pencil sharpener. Combine pencil and pencil sharpener to get sharpened pencil. Use sharpened pencil on notepad and get the paper. Right click the paper in inventory to read D3 - 7422. Locked drawer - The drawer is locked. Pull back and right click the flower by the small file drawers to get key. Use key on locked drawer. Take the archive stamp. Pull back. Computer password - The computer needs a password. Felix doesn't work but remember that Felix' picture is upside down. Enter xilef and press enter. Peter Nedole is the contact at State Institute. Automatically, print the copy of the report by Barbora. Take the printed report from the printer. In inventory, use the stamp with the report to get stamped report. Tube post - Exit the office and go to the tube post by elevator. Click Barbora's ID on the tube post screen and immediately while the green light is on - click the paper with numbers on the tube post. Take the German NiBiRu 1943 documentation. Read - right click the German document in inventory. Learn about the extraterrestrial entities, connection with Mayan and Sumerian civilizations, new metals found in Mexico and new weapon technologies. Exit the building, the park and then leave area. Bureau Building: Enter the building beside the guitar playing beggar. Talk to the secretary twice and get her call card. She won't let you in through the President's door. Talk to her again. Get the secretary out of the way - After talking to the secretary 3 times, go outside and ask the beggar about the secretary. She drives a silver Mercedes. Go to the car by the main road. Left click and then right click on the car. The license plate is A7 15 37. Click the call card on the cell phone and find out how Martin got the secretary out of the way. Enter the building and go through the President's door. Talk to the President. Watch. He wants a direct report when you're finished at the site. Get the permission automatically. Camp: You are not allowed into the mine and there's a 'colleague' in the camp. After some talking, look around. Talk to the Major and learn about the mine. Try to look at the plans of the mine he's working on. Go farther into the camp. Note the mushroom at start of bridge. Talk to Petr Stasek, civilian-historian at the trailer. Check the locked cabin behind the trailer. Go right of trailer and talk to the soldier guarding the mine 3 times. Go back and talk to Stasek about everything. He gets nervous about the cabin talk. Click on Stasek again and see resemblance to picture. Talk to the soldiers by the gate several times again. Talk to Stasek again about the mine and his plan to get both of them in the mine. Feed the soldier - It's midnight. Go inside the trailer. Look around. Right click the raincoat in the corner and get a paper with D2 82. Take 2 cans of beans from the counter. Take the can opener on the table. Go outside and talk to the soldier by the gate. Learn about the lights and the cabin. Talk to him twice until he asks for food. He's hungry. Now you can take the mushroom by the bridge. Go to the trailer. Click the can opener on the can of beans to get opened can of beans. Click the mushroom on can of beans to get canned beans with mushroom. Use match on stove. Place opened can of beans with mushroom on stove. Give the heated food to the soldier by the gate. Enter the tent - Go back to the trailer area and then go back to the soldier by the gate. He calls you over. Uh Oh. The food you gave him made him sick. He leaves you to guard the gate. Enter the tent. Right click the major's uniform and get keys. Take radio from table at right. Cabin behind trailer - Use the keys on the cabin door. Look around. Take rope from shelf. Take hammer and tool box from right workbench. Open the tool box in inventory and get hand oiler, string, screwdriver, flashlight and wrench. Use screwdriver on the lid of generator. A phone is ringing. Go to the locked locker and use the hammer on the padlock of the locker. Look inside the locker and see body of man. Click on him again. Right click and see that the ID is Petr Stasek. We now know who the murderer is - the impostor. Go back to the opened generator and click on it twice to turn off the outside lights. Exit and see the soldier by the mine come to check. Martin hides under the trailer. Automatically enter the mine. The lights come back on. Entrance of mine - Look around. Look at a rod sticking out of the drum on the right by the sign. Click on it twice until you realize you can't pull it with your hands. Use wrench to get iron rod. The path goes forward or left corridor. First left corridor - Take the left corridor and see barrel and netting on the ceiling. This ends in a cave in. Look at the cave in and then use the iron bar on the boards holding the cave in. Look at the crevice made. It's dark in there. Use flashlight on the crevice and see a body of a dead soldier. Take the pin on his shirt. Click on his pocket and right click to get small set of keys. Go back to main corridor. Main corridor - Take the forward corridor. Look and click twice to get the cramp stuck on left of the beam. Here, the corridor again splits to left, forward and right pass the cogwheel. Second left corridor - Take the left corridor by the location where you got the cramp. See that it ends on a hanging load over a closed lid. Look right from load and see a small opening on the metal wall. It looks like something is missing here. The heap of earth under the opening is now active after seeing the opening. Click on heap of earth and use the cramp to dig on it. Get a valve control wheel. Wow, Martin just placed that wheel in his pocket! Use valve control wheel on opening above dirt. Click on wheel to turn it. The load is lowered to the closed lid. Take the hook holding the load. Go back to main corridor. Right corridor - Take the right corridor pass the cogwheel. See a flooded corridor with soaked boxes in murky water. Use flashlight on the murky water and see a can full of oil. Combine hook and rope in inventory to get anchor. Use anchor on can to get can with oil. Go back to main corridor. Go forward and see a metal door. Note the Nazi sign and eagle symbol above the door. Note the vent on the left. Round metal lock - Look close at the round metal lock at the middle of the door. Click on the center and see that it has a small opening for a key. Use set of keys on the small opening. Click on the 4 wheels to turn it. One is stuck. Use hand oiler on the stuck wheel. Ugh. It's empty. Combine empty hand oiler with can of oil. Now, use the hand oiler on the stuck wheel. Turn the wheel so that the lock opens but how? 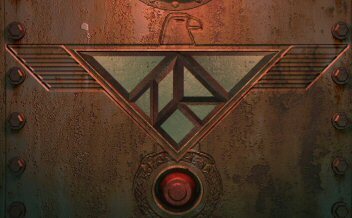 Remember the Nazi insignia - turn the top to have opening to the right, turn the right wheel to have the opening to the bottom, turn the bottom wheel to get opening to the left and turn the left wheel to have the opening to face top. Secret bunker: It's dark in here and the flashlight bulb gave out. Click twice on the light colored lamp on the left shelf. Use matches on the oil lamp with kerosene. Lights, please - Click on generator and see engine and 2 valve controls. Turn the 2 valve controls. One is stuck. Use hand oiler on stuck valve control. That doesn't work, still stuck. Use wrench on it and then turn it. Pull lever on left wall of the generator above the engine. Great, it works. Go on through corridor. Main Corridor - Read the sign on right wall. Right wing - archive, left wing - stock room. Click twice on the light switch on the left wall. Archive - Take the right corridor and see a locked steel door. Use the set of keys and it breaks. Now what? Stock room - Repository - Take the left corridor and see old crates and barrels. Use the set of keys taken from dead soldier. Enter stock room. Look around at everything. Use cramp on the crates on the right of the corridor. Take dynamite stick. Take test tube (which is really a flask) from back wall. Check the old battery in front of the tank and click twice to turn it over. Use flask, I mean, test tube on battery to get acid. Enter alcove SA-44 with shelves on the right. Take light bulb from box. Take a can of kerosene (right click to check the can in inventory). Exit. Archive - Use the battery acid on the steel door with the broken key in the lock. Enter the war archives. Look around. Click on the files on left wall for a closer look. Look at paper taken from the coat pocket at the trailer - D2 - 82. Click the paper with numbers on file drawer D2-82. Take the small metal case between the folders. Right click on the box in inventory and get several magnets. Go to bottom of screen to archives. Read the sign by the platform. Check the ladder beside it. Look close at the table. Take magnifying glass from the red shelving, ruler and empty box. Look at the yellow lamp at opposite wall. Right click to see that the light bulb is missing. Use light bulb on lamp. Check the levers beside it. 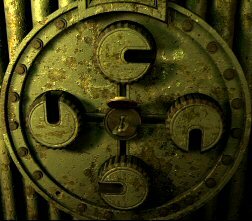 Open the Secret door - Try to open the metal cabinet right of lever. Click on groove on the floor by the left leg of the cabinet. 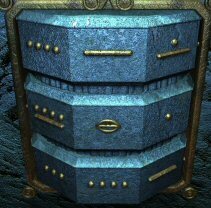 Now, click on the cabinet to move it and expose a secret wall. The wall doesn't have a lock. Use cramp on wall and a crevice-crack is now seen. Use dynamite on crevice. Click the matches on dynamite and see that the fuse is too short. Go back to stock room. Take dynamite from the crate. In inventory, right click the dynamite to get fuse. Go back to the dynamite on the wall at archives. Use fuse on dynamite inserted on wall. Now that the fuse is longer, use matches on dynamite. The crevice grew bigger but the charge was not sufficient. Catch that rat - Go back to the main corridor at the intersection. Click on rat hole under the sign and across the light switch. In inventory, combine empty box and ruler to make rat trap. That's not enough. Open the can of beans with the can opener. Combine the opened can of beans to the rat trap. Click rat trap with beans on rat hole. Time to go somewhere - go to the stock room and get another dynamite. Go back to main corridor and see a rat enter the trap. Take trap with a rat inside it. The rat hole is located where the cursor is placed. Live Charge - Right click the trap in inventory to get rat. Go back to the hole in the crevice in archives. Click the rat on the dynamite to make a live charge. Click the live charge on the crevice. Martin automatically lights the dynamite and inserts the live charge on the crevice hole. Secret room - Enter the secret room. Martin feels watched. Click on light switch by door. Look around and click on Vitrola record player. Take the flat iron from the table. Look at the iron cover on the wall behind the desk. There's a small opening on the cover. Take the journal of a scientist from the table. Read the journal in inventory about the prototype, Mexico, Mayan Jaguar temple, energetic fusion and signed, Dietrich Raumhart. Raumhart threw the key of the safe into the drain in the lab. In inventory, use the magnifying lens on the journal and see something suspicious on the last page of the journal. Massive door to the lab - Go to the massive door at the end of the main corridor. Look left on the panel. Place the magnets taken from the box in archives on the inverted triangle. Click the magnet to select it. Right click to rotate it. Take the magnets out of the working area-triangle and to see the different magnets. Arrange the magnets to fit in the triangle. Laboratory - Enter the elevator and the lab. Hear the report of one of the archeologist entering the mine. Look around. Journal code - Click twice on the table on the left and get an unusual magnet. There's Bunsen burner on the table. Add kerosene to the Bunsen burner. Use match on filled Bunsen burner. Place the flat iron on the burner. Wait a bit. Remember there was a suspicious last page in the journal seen by the magnifying lens. Use heated iron on now opened journal. See 47922. Safe key - Look close at the drain by elevator. It looks like a small key. In the inventory combine string with the magnet to get magnet with string. Use magnet with string on drain to get small key. Safe in secret room - Go back to the secret room. Use small key on iron cover behind the desk. Enter 47922. Left click to move the dial clockwise (c) and right click to go counterclockwise (cc). c to 4, cc to 7, c to 9, cc to 2 and c to 2. Take the statue. Meet the impostor Stasek. 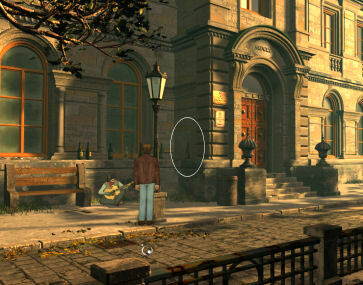 As soon as the statue is thrown, click on the lever left of the door. Watch! Hotel: The inventory has the wallet, pin, statue and journal. Look around and then enter the hotel. Get room at hotel - Ring the bell on the counter. The receptionist says that all rooms are occupied. Talk to the drunken guest who is waiting for Daniel Dobrovsky. Look at ashtray on counter to get Hotel matches. Right click the matches in inventory and see the hotel phone number 547 926 12. Exit the hotel and click on phone booth. Martin cancelled the reservation of Dobrovsky. Go back to the hotel and get room 24's key from receptionist Martin asks the receptionist to look for the phone number of Professor Francois de Vilde. Take the staircase to the rooms. Enter the first room on the left on the first floor. After resting, go down to the reception desk and get informed of the Professor's phone number. Use the hotel phone and talk to Francois. Exit the hotel and go left to the docks. Talk to the fisherman 3 times and finally, help or not help with the crates will get you on the boat to the Mansion. Mansion: After telling the fisherman to wait, you will now face the mansion gate. Ring the doorbell and enter the mansion. Talk to the Professor. He states that his intention was to get real evidence of extraterrestrial life. He has a key taken from the Temple of Stone. There are 3 keys in total. The last one is at the Temple of Dawn. Martin is to go to Mexico with a letter for Francois' good friend in a junkyard in Tecolut. He gives an airline ticket together with the letter. The 2 keys will be in his safe. The map will be given tomorrow when he comes back. Right click the envelope with ticket to get flight ticket and letter. Exit to the gate and to the pier. Dock: A surprise waits Martin at the fisherman warehouse. Meet the villains: Dietrich Raumhart and his son, the impostor that you met in Bohemia. After waking up, talk to Raumhart's son. He throws a knife on the floor as an aid to free yourself when he leaves. 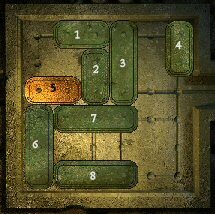 Get free - This is a very forgiving 1 minute timed puzzle. Take the knife on the floor. Use the knife on the red button left of Martin. This opens the storage door and barrel rolls out. The barrel hits the table that drops the container that will be fatal to Martin. This stops the time count. Use the pin on the handcuff hidden behind Martin. The door is locked. Climb the ladder on post at center of the room. Mansion: Find out that the professor is dead. Talk to the detective. They think it is suicide with an accompanying suicide note. Show the letter to the detective to prove that it is not suicide. Enter the mansion. Take the pyramid on the table. Right click the pyramid to note a small opening. Go to the bookcase. Look around. Check the phone in the corner. Click on red button to play message from Piere and another from a familiar voice. Map - Click on hourglass on the bookshelf right of the fireplace. Wait a bit, look around and then click on hourglass again to see a key inside the hourglass. In inventory, use knife on hourglass to get key. 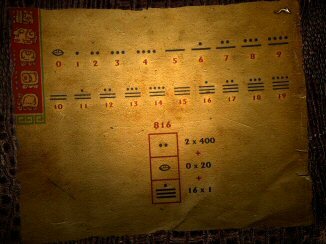 Use key on pyramid to get old Mayan map. Safe - Click on the Tikal picture. Click on bust on fireplace mantel. This opens the safe. What is the combination? Let's try TIKAL. Based on the letters of the phone dial buttons - click on 84525. Press the arrow to enter. The statues are gone! Exit the house and talk to Inspector Clouseau and then to the police at the gate. Hotel: Enter the hotel and see the villain. They are staying in the same hotel at room 32. Get inside the hotel - Exit the hotel and go to the back of the hotel. Talk to old Iris. Look around and check the fire escape ladder. It's too high. Click on the walking stick hanging on the garbage can beside Iris. Hmm... Talk to Iris about the walking stick. After a lesson in manners, she wants a hot dog from the stand. Hotdog - Exit the alley and go to snack shop. Ask for and get a hotdog with mustard. Give the hotdog to Iris. Oops. Get a hotdog with no mustard, just ketchup from the snack shop. You end up with plain hotdog. Enter the hotel and take the ketchup from the reception desk. In inventory, combine hotdog and ketchup to get hotdog with ketchup. Give hotdog with ketchup to Iris. Take the walking stick and use it on the fire escape. Get the guests out of the way - Take the stairs to lower floor. Click on door at end of hall. Talk to repairman and learn that the room at end of hall is a service room. Go back to your room. Unplug the cord from the outlet by the bed. Take the vase on the table and click it on the outlet. Exit and talk to repairman. Take the keys hanging on the ladder and use it on the service room at end of hall. Enter the service room at end of hall. See a fire alarm on top of left wall. Take a broom, diluter in red bottle and rag from floor by the window. In inventory, combine broom with rag, then click it on diluter. Use match on the combination. Automatically, Martin will place it close to the fire alarm sensor. Get the statues - Now that the guests are evacuated, time to get the stolen keys. Go down to the reception desk and click on the keys. Right click to take Room 32 key. Go up 2 flights of stairs and use room 32 (villain's) key on door right of the plant stand. Enter and right click on the bed. Numeric code lock - Click on each number to scroll through all the numbers. Listen and stop on a cluck sound. Do this to all the 3 numbers. If the 3 different sounding numbers are selected, Martin talks about taking the keys and leaving the hotel. This is a random puzzle. My code was 371. Tecolut: After a long flight and bus ride, Martin arrives in front of George's shop in Tecolut. Note the fountain. Look at the note on the note on George's store - I went to Rosie's. Enter Bar - Go on through the street. See a man asleep on a bench. Talk to the bouncer of the bar. It's poker night. He will let you in the bar if you can get Isabella to see him. Enter the pub. Talk to the bartender and then George. George - At George's place, Martin rested for the night. Next morning, talk to George about Temple of Jaguar. 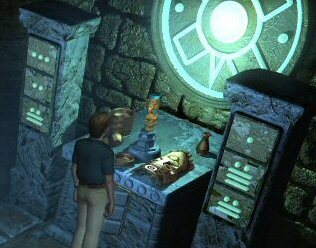 The map showed the flashing Temple of Jaguar. Ask about Temple of Dawn. A new place in the map showed the Temple of Dawn. Look around the shop. Exit the shop and talk to the stall keeper under the red canopy. Martin buys a stone statue. Go back inside George's shop and ask about the jeep. Now you have transport. Click on the yellow jeep. Temple of Dawn: Talk to tourist who asks for a picture of the inside of the pyramid. The camera is in inventory. Ruins - Enter the doorway on the left to get inside the Ruins. Look at the opening on the floor. Martin threw a rock to find out about water at the bottom of the well. Check the stone disc on the wall. There are openings on both sides of the disc. Go outside and left to the temple. Temple of Dawn - Look at the statues at both side of the entrance to the temple. One is missing something on his nose and the other has a drum on its nose. Click again to try to pull it out. Enter the temple and talk to the archeologist, Paul Vasquez. Listen to the translation. Talk to Paul again and get his permission for the picture but he wants stone scrap from the archeological site to compare to his work in the temple. Look around the temple. Archeological site - Exit the temple, go to ruin and then go to the archeological site on the right. Talk to the archeologist Piere and then ask about the scraps. Take the box of scraps (fragments of clay) from the table with vases. Talk to Pedro, the fake archeologist on the left. Meet him tonight to get inside the pyramid. Temple of Dawn - Go back to the temple and Paul. Give Paul the box of clay fragments. Take a picture of the stone relief of a Mayan Sun King behind the stone pedestal. Talk to the tourist and he gives the stone cylinder he picked up. Go to the temple and look at the 2 statues again: one with a drum as nose and the other one without a nose. Try to pull the drum-nose on the left statue. It will not get pulled. Place the stone statue bought from the stall keeper on the statue with no nose. Then go back and pull the nose of the other one to get stone cylinder. Ruins - Go back to the ruins and insert the stone cylinders on the openings at sides of the stone disc. Press the stone disc. A platform rises from the opening on the floor. Colored balls puzzles - Look close at the colored balls puzzle. Note the colors of the arrows at each end of the balls. Arrange the balls according to the colors of the arrows. Top is red, right is green, bottom is white and left is yellow. I did this by arranging the inner colors first going outwards. There's an empty slot at the outer layer that you can place ball on to make space for ball addition on that set of balls. The layers can be turned clockwise or counterclockwise by left or right click of the mouse on the layers. The balls can be moved to an open space by clicking on it. It is touchy - so be sure that the cursor is on the ball and not on the layer. Good luck! At the start of the puzzle, Save your game before you touch it. In the close up you’ll see the balls arranged in four radial arms at clock positions: 12, 3, 6 and 9 o’clock. If you look at the little arrows at each clock position, you’ll see which colors are to finally go on the arms: 12 o’clock = red; 3 o’clock =green; 6 o’clock =white; and 9 o’clock = yellow. When you start, the balls are arranged from inside out on each arm as: white, green, red and yellow. Obviously, you’re going to have to do some jiggling to move the balls around so that there is one of each color in each ring in the correct aspect to each other. Keep the relationship of the colors to each other in mind as you go, and think Rubik’s cube! That’s what gave me a clue to finally solving this wretched little monster! You’ll see there are four rings, plus an outer ring with a ‘free’ spot, that you can temporarily park a ball on. I labeled mine from center outward as 1R, 2R, 3R, 4R and OR (for outer ring). All the rings move either clockwise or counter-clockwise with L or R mouse clicks. Clicking on a ball will move it to an empty space. Clicking on the empty space just moves that ring, so position your mouse carefully when you’re clicking. R mouse click your OR to the 6 position. Click on each ball and move each one outward. That leaves a slot on the 1R to move something into. R mouse click OR to 3 position. Insert yellow ball into the 4R. R mouse click OR to 12 position. Move all balls outward. R mouse click 2R. At 12 position move red ball to center. R mouse click 3R. At 12 position move all the rest of the balls toward the center. R mouse click OR to 9 position. Move all balls outward. R mouse click 2R. At 9 position move yellow ball toward center. L mouse click 2R. At 12 position move red ball toward center. Move yellow ball down to 3 R.
L mouse click OR. Move yellow ball in to 4R. R mouse click OR. At 9 position move all balls outward. R mouse click 3R. Move one yellow ball in. R mouse click 4R. Move remaining yellow and the green balls in. R mouse click OR to 6 position. Move all balls outward. L mouse click 2R. At 6 position move the white ball in toward center. R mouse click 3R. At 3 position move the green ball toward center. L mouse click 3R. Move all white balls in toward center. L mouse click OR to 9 position. Move green ball onto OR. Also, move 3R yellow ball to 4R. R mouse click 4R. Move 4R yellow ball to 3R then L click 4R. You should now have all yellow and white balls in their proper positions. Now to fix red and green! R mouse click 3R. At 12 position move 3R red ball to 4R. L mouse click 3R. At 3 position move 2R green ball right to 3R. L mouse click 3R. At 3 position move 3R green ball to 2R. R mouse click 4R. At 12 position move 4R red ball down to 3R. R mouse click OR x 2 and pop green ball onto it’s proper arm. If done correctly, a panel opens on the side. Take the prism. Look at the prism in inventory. Archeological site - Go back to the archeological site and talk to Piere. Ask about Pedro. Talk to Pedro and meet him 3 hours later. Martin goes back to the village. Tecolut: Martin is approached by a boy with a message. He is supposed to go to Rosie's Bar and meet someone. Go to the bar. Talk to the bouncer. Enter the bar and see Raumhart, the old man. Hear his request to find the White Bear, oldest of the Mayan and learn the path to the Machine of Life. You must destroy the machine. A new place in the map is shown. Click on the jeep and go to the new place. Mayan Village: Meet White Bear. Learn about the prophecy. You are the Messenger of the Gods. The one that unites the long lost symbols of life and bring Annunaki back. You must obtain the last one and unite the power. Tecolut: Back at the village, enter George's shop and talk to George about equipment. After resting, pick up bag from counter. Right click bag in inventory to get rope, lamp, lighter and hammer. Click on jeep outside. 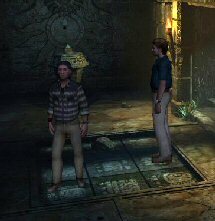 Temple of Dawn: Meet Pedro and he pushes left stone statue that opens a squares on the floor. Open the entrance to inner part of temple - Take stone on floor by middle column. Place the pyramid on the stone pedestal. Click on the opening in the middle of the Sun held by the Mayan Sun God. Martin opens the cover and rays pass through the prism to shoot out 3 rays on the squares on the floor. Pedro stands on one square. Place the stone on one of the 2 squares. Now, step on the last square. Deep part of Temple: The stone panel on the left moves to show an opening on the floor. Click the rope on the statue on the left. Climb down and see that the steps into an abyss. In inventory combine lighter and lamp. Look at the panel on the wall. The aim is to get the gold bar #5 to the right to the open mouth. Left or right click to move the metal bars. 8 left 3xs, 3 down 3xs, 4 down 2xs, 5 right to exit. Another set of stairs pushes out. Water God and Death God - Go down deeper into the temple. Use lighter on torch on the right wall. Look at everything. Check the God of Water and the opening left of the God of Water. Check the sink twice that possibly held water and symbol. Check and right click the stone plate - God of Death. How do I open this door, though? Open the door or Pedro, Water! - Go back to the rope and talk to Pedro. Ask for water. Take the bucket of water. Use bucket of water on sink. Use hammer on opening left of the sink full of water. Pull lever-hammer and see water spill from a crack. Click on the crack to see where the water came out of. Talk to Pedro again for more water and then later plaster. Catch the can of plaster and take the bucket of water. Right click the can in inventory to get can with plaster. In inventory, click can with plaster on bucket of water to get stirred plaster. Use stirred plaster on crack. Use bucket of water on sink. Pull down the lever-hammer. Nothing happened. Go to Pedro for more water. Hahaha! Take the bucket of water. One more time, place water on sink and pull lever. The water snake symbol lights up and the door opens. 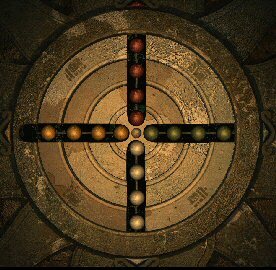 Third Statue of Life - Enter and see a path lined with symbols that ends in an altar. Click on the symbols on the side of the path. Take the artifacts from the altar. There's the last statue, symbol of life. If you take it now, you die from green poisoned gas emitted by the stone heads. Look at the symbols at the base of the altar. These resemble the one in the back of the map. Look at the back of the map and hear the explanation. The bottom square is for ones, the middle is for twenties and the top square is for 400s. Look at the numbers on the columns on the sides of the altar. Hear music and see the heads that spew poison turn. Take the gold statue - last symbol of life. Go back to Pedro and ask for the rope. After giving the gold to Martin's new friend, he goes back to White Bear. White Bear - White Bear adds the location of the burial ground of the ancient kings. He gives the Amulet of Kings. Martin drives to new location - the Lost Temple of Gods. Lost Temple of the Gods: Climb up the stairs of the temple and see the slider lock to the temple. 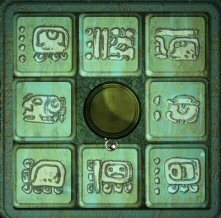 The aim of the slider puzzle is to place the tiles with glyphs over the identical glyphs hidden under the tiles. Save Game here! This is a random puzzle. Enter the temple and see 3 monoliths around a central pedestal. Place the 3 statues on the monoliths. The statues will flash on the correct monolith. Place the red statue on the left monolith, the white statue at middle and the green statue on the right monolith. The machine rises. Oh! Uh Oh!